Waiting to Join Oriflame for free? If you really want to make lots of money with Oriflame, here is your chance to join Oriflame for free. You can join Oriflame with me and take advantage of the Oriflame Opportunity to earn cash and cheque income month after month. There are many benefits of becoming an Oriflame consultant. Besides cash income on personal orders from friends and neighbors. You get more and more monthly cheque income as more and more people become Oriflame consultants under you. I have been to many foreign trips with Oriflame. My next trip is to Paris. You can get gifts for various achievements as well as foreign trips. How to do all this? If you are willing to learn I will teach you everything and guide you step by step. It is unbelievable but it is true that anyone can join Oriflame for free and make money by working from home. You can gifts worth 5000 or more for doing 100 points in your first 3 month. This is know as the Oriflame welcome program for new Consultats. In addition, if you want to learn how to make monthly 25,000 or more then let me know when you join my team. When you call me to complete your joining procedure just let me know your intention so that I can guide you accordingly. 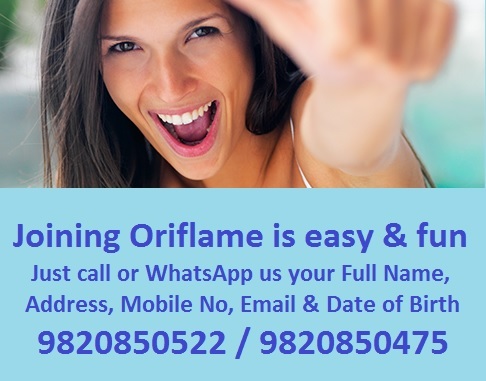 For joining sms - 'I want to join Oriflame - full name, address, mobile, email and Date of birth' on 9820850522. I will guide you when you place your first order in Oriflame. Everything is online. And I am always there to guide you.